Sentinel lymph node (SLN) biopsy (SLNB) has demonstrated accuracy in the axillary staging of breast cancer patients. Despite variability in selection criteria and technique, an SLN is consistently identified in approximately 96% of cases and in most series predicts the status of remaining axillary LNs in >95% of cases. The false-negative rate of sentinel lymph node biopsy (SLNB) was originally reported as 5%–10% (sensitivity 90%–95%), but improved rates are attainable by experienced surgeons. 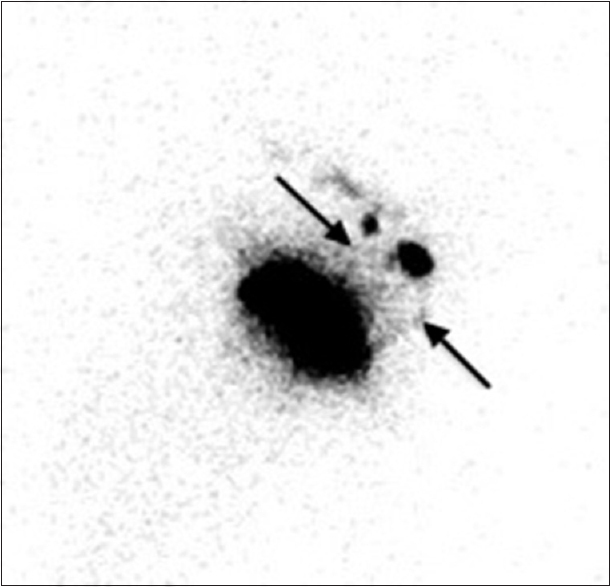 Radiolocalization with lymphoscintigraphy (LSG) increases SLN identification rates. LSG is a useful tool to establish the abnormal lymphatic drainage patterns and to detect the extra-axillary nodes, particularly internal mammary nodes. Despite controversy regarding the optimal injection method, studies have generally suggested high concordance between the various radiotracer application sites and axillary SLN identification. Discordant SLN identification would have implications for nodal staging as the true SLN might not be identified with individual injection techniques. In the current study, imaging from consecutive patients presenting for breast LSG over a-19 month period was retrospectively reviewed. Radiotracer application was performed with simultaneous injection of peritumoral, subcutaneous, and subareolar regions. This application method provided a mechanism to assess the LSG drainage patterns with a view to assessing injection site concordance and SLN identification rates. Data from 123 breast LSG patients were reviewed. Using our radiotracer technique, the axillary SLN identification rate was 98%. A single axillary node was detected in 110, two axillary nodes were detected in 10, and no axillary node was detected in three patients. Among those 10 patients in whom two axillary nodes were seen, at least two cases of discordant drainage occurred from different injection sites. This study demonstrates that different LSG injection sites can result in the identification of different axillary sentinel nodes although this appears to be a rare event. This finding may be of clinical importance if the true SLN is sought. In addition, the multisite injection technique appears to be an optimal method of axillary SLN identification, with high SLN detection rates. Axillary node status is a powerful predictor of long-term survival in patients with breast cancer and continues to have an important influence on clinical management.,,,,, Sentinel lymph node (SLN) biopsy (SLNB) has demonstrated accuracy in the axillary staging of breast cancer patients, has low morbidity, and increasingly reflects standard practice among Australian and New Zealand surgeons. A number of studies have demonstrated that a combination of radiolocalization with lymphoscintigraphy (LSG) and blue dye mapping increases the success of SLN identification.,,, The added value of blue dye has been shown to be particularly useful for patients with positive preoperative LSG, having received neoadjuvant chemotherapy, or undergoing superficial injection of tracer agents. Despite controversy regarding the optimal method of injection, studies have generally suggested a high concordance among the different techniques of radiotracer application and axillary SLN identification.,, This observation has been articulated as the “all roads lead to Rome” model, whereby distinct injection sites will nonetheless drain to the same axillary SLN. Although we know that both superficial and deep injections of radioactive tracer and blue dye are effective for axillary SLN identification, the clinical consequences of discordance rates between the two injection techniques are less clear. Deep injections are associated with greater extra-axillary identification; however, this may not have a significant impact on clinical management. Here, we describe a retrospective assessment of a novel LSG technique, where the patients were simultaneously injected with radioisotope in the PT, SC, and SA regions. The aim of this study was to assess the LSG drainage patterns with a view to assessing injection site concordance and SLN identification rates. Discordant SLN identification would have implications for nodal staging as it suggests that the true sentinel node might not be identified with individual injection techniques. Imaging from 123 consecutive patients who presented for breast LSG over a 20-month period was retrospectively reviewed. The median patient age was 54 years (range 26–88 years). 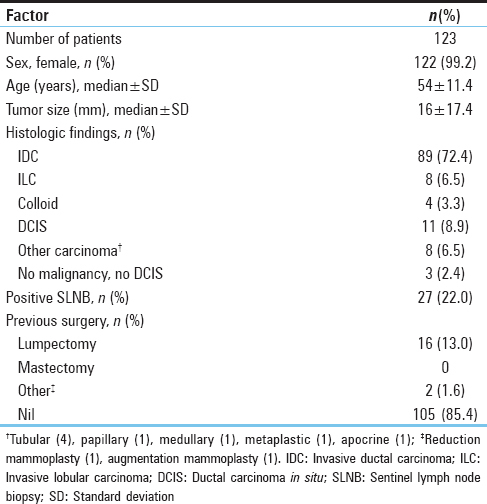 Invasive ductal carcinoma was the primary breast lesion in 72.4% of patients. The median tumor size was 16 mm (range 1.5–120 mm), and the majority of patients had no previous ipsilateral breast surgery at the time of presentation (85.4%). Other patient characteristics are shown in [Table 1]. All surgical and pathological reports were retrospectively reviewed. Methylene blue dye injection was used in all cases. Patients who presented for breast LSG were administered four 10 MBq (same day) or 40 MBq (next day) injections of Tc-99 m antimony sulfide colloid in 0.7 mL (Lymph-Flo, RAH Radiopharmacy North Terrace, Adelaide). Each patient was injected into the PT region, the SC region overlying the tumor, and the SA region in the quadrant of the tumor. Following injection, the patient was instructed to perform gentle massage of the breast for 15 min unless there was a localizing wire in situ. Initial image acquisition commenced at 15 min with a Philips BrightView single-photon emission computed tomography (CT)/CT dual-head gamma camera and a low energy high-resolution collimator. High-resolution images were obtained with a 256 × 256 matrix size. Sentinel node location was marked on the skin with indelible ink with the guidance of a Co-57 marker pen. Following LSG, the patients proceeded to surgery either on the same day (71%) or the following day (29%). For all 123 patients, the scintigraphic images were retrospectively evaluated with a view to assessing axillary sentinel node drainage patterns. The evaluation was performed by one nuclear medicine physician and one trainee. Where there were differences of opinion, a consensus was reached. All data tabulation and statistical analysis were performed using SPSS 22.0 (IBM, Armonk, NY, USA). Data from 123 breast LSG patients were reviewed. The axillary SLN identification rate, defined as the number of patients in whom an axillary SLN was found divided by the number of patients in whom LSG was performed, was 98% [Table 2]. No axillary SLN was identified in three patients. In two of these cases, no nodal drainage was identified in any region. In another case, nodal drainage was identified in the IM chain only. Two of three patients without axillary drainage had undergone previous breast surgery: lumpectomy with SLNB in one case and reduction mammoplasty in another. Blue dye was injected intraoperatively in each of these cases, two of which had colored sentinel nodes biopsied and the third had a local wide excision only and no SLNB. Of the 120 patients with axillary SLN drainage, a single axillary node was detected in 110 patients. Two axillary nodes were detected in 10 cases [Table 2]. Of the 110 patients with only a single axillary SLN, a single lymphatic channel was identified in 98 patients whereas multiple lymphatic channels were identified in 12 patients. In the majority of cases, it was not possible to correlate individual injection sites with different drainage patterns among these patients with multiple axillary lymphatic channels. However, in two cases, we were able to clearly identify the individual lymphatic channels from separate injection sites converging on a single axillary SLN [Figure 1]. This result supports the previous findings that suggest the different injection sites be generally concordant. In contrast to this, of those 10 patients in whom two axillary nodes were detected, discordant drainage was identified in two. In each of these two cases, it was possible to observe separate lymphatic channels from distinct injection sites, each draining to a different (discordant) axillary SLN [Figure 2]. In another four cases, separate channels were observed draining to each axillary SLN, but it was unclear whether drainage originated from the same or different injection sites. In another four cases, discrete lymphatic channels were not observed leading to either node. Axillary node status remains an important factor in determining the prognosis and management of patients with breast cancer., Accurate axillary staging is therefore of critical importance. SLNB has been widely adopted by Australian and New Zealand surgeons,, and radiolocalization with LSG in combination with blue dye mapping remains the optimal method in SLN identification. As well as the application technique, a number of other factors influence LSG axillary SLN detection rates. These include previous breast surgery, older patient age, increased BMI, and tumor grade.,,, Interestingly, in our sample of three patients in whom axillary SLN detection was not possible, two of them reported previous breast surgery. One of these patients had undergone previous lumpectomy and SLNB, while the other had undergone reduction mammoplasty. This raises the possibility that nondetection in these patients may have been related to prior breast surgery although there are currently little published data regarding the impact of aesthetic breast surgery on axillary SLN detection rates. One study of 20 patients who underwent breast reduction mammoplasty did not find any corresponding change in LSG detection rates. Prior studies have shown that differing SLN techniques can identify nonaxillary nodes in up to 43% of patients depending on the type and volume of tracer, injection technique, and primary tumor location and size., In addition to superior or equivalent rates of axillary SLN, our method of radiotracer application also enabled detection of IM lymph nodes. This is in contrast to the SC and PA techniques where IM drainage is not reliably demonstrated., IM drainage has prognostic significance for patients with positive axillary SLN results, and if IM radiotherapy is to be considered, deep injection techniques are required. In our series, 13% of the patients demonstrated IM drainage [Table 2], similar to the previous findings. Published studies overall have suggested very high concordance between the different techniques of radiotracer application.,, The anatomic basis for this appears to be the presence of several lymphatic channels converging on the same axillary SLN. This has been articulated as the “all roads lead to Rome” model. There have been some conflicting results, however, highlighting the importance of further study. Our results have shown examples of different injection sites, leading to the same axillary SLN via different sentinel channels, in accordance with the “all roads lead to Rome” hypothesis [Figure 1]. It remains important for those involved in SLNB to be aware of the different drainage patterns of superficial and deep injections which are both covered in our injection technique. In performing a retrospective analysis of breast LSG using our injection technique, we were able to qualitatively assess drainage pathway discordance. In this context, we defined discordance as occurring when different injection sites led to the identification of a different axillary SLN. In two cases, we were able to directly observe discordant axillary SLN drainage via different injection site techniques [Figure 2]. Identification of such SLN discordance with the different injection sites has implications for nodal staging if the “true” SLN is not identified with a particular injection technique. As stated previously, the two patients with discordant drain-age each received two PT, one SC, and one SA injections of tracer. This study has a number of limitations. Due to its retrospective observational nature, we were unable to directly compare our high multisite technique detection rates with single-injection techniques. The staff in our Department have considerable experience with breast LSG which may partly account for the high detection rate seen. Indeed, operator inexperience has a known association with lower SLN detection rates. Second, the false-negative rate in our sample was unable to be calculated. Whether our radiotracer application technique resulted in fewer non-SLN discoveries of metastatic disease remains unknown. We have demonstrated that different LSG injection sites can lead to the identification of different axillary sentinel nodes. This finding may be of clinical importance if the “true” SLN is to be sought with LSG. We have also described a novel triple-site technique of radiotracer application in breast LSG. This technique was associated with a high axillary SLN detection rate and allowed identification of IM drainage. In view of these findings, our triple-site injection technique appears to be a good method, with further investigation required, of axillary SLN detection. However, if two (or more) sentinel nodes are identified using this technique, they both require pathological assessment for accurate staging. Mabry H, Giuliano AE. Sentinel node mapping for breast cancer: Progress to date and prospects for the future. Surg Oncol Clin N Am 2007;16:55-70. Straver ME, Meijnen P, van Tienhoven G, van de Velde CJ, Mansel RE, Bogaerts J, et al. Sentinel node identification rate and nodal involvement in the EORTC 10981-22023 AMAROS trial. Ann Surg Oncol 2010;17:1854-61. Veronesi U, Viale G, Paganelli G, Zurrida S, Luini A, Galimberti V, et al. Sentinel lymph node biopsy in breast cancer: Ten-year results of a randomized controlled study. Ann Surg 2010;251:595-600. He PS, Li F, Li GH, Guo C, Chen TJ. The combination of blue dye and radioisotope versus radioisotope alone during sentinel lymph node biopsy for breast cancer: A systematic review. BMC Cancer 2016;16:107. Donegan WL. Tumor-related prognostic factors for breast cancer. CA Cancer J Clin 1997;47:28-51. Jatoi I, Hilsenbeck SG, Clark GM, Osborne CK. Significance of axillary lymph node metastasis in primary breast cancer. J Clin Oncol 1999;17:2334-40. Veronesi U, Paganelli G, Viale G, Luini A, Zurrida S, Galimberti V, et al. Sentinel-lymph-node biopsy as a staging procedure in breast cancer: Update of a randomised controlled study. Lancet Oncol 2006;7:983-90. Chong C, Walters D, de Silva P, Taylor C, Spillane A, Kollias J, et al. Initial axillary surgery: Results from the BreastSurgANZ quality audit. ANZ J Surg 2015;85:777-82. Torrenga H, Meijer S, Fabry H, van der Sijp J. Sentinel node biopsy in breast cancer patients: Triple technique as a routine procedure. Ann Surg Oncol 2004;11:231S-5S. Syme DB, Collins JP, Mann GB. Comparison of blue dye and isotope with blue dye alone in breast sentinel node biopsy. ANZ J Surg 2005;75:817-21. Cody HS 3rd, Fey J, Akhurst T, Fazzari M, Mazumdar M, Yeung H, et al. Complementarity of blue dye and isotope in sentinel node localization for breast cancer: Univariate and multivariate analysis of 966 procedures. Ann Surg Oncol 2001;8:13-9. Teal CB, Slocum JP, Akin EA. Evaluation of the benefit of using blue dye in addition to radioisotope for sentinel lymph node biopsy in patients with breast cancer. Breast J 2005;11:391-3. Krynyckyi BR, Kim CK, Goyenechea MR, Chan PT, Zhang ZY, Machac J, et al. Clinical breast lymphoscintigraphy: Optimal techniques for performing studies, image atlas, and analysis of images. Radiographics 2004;24:121-45. Paganelli G, Galimberti V, Trifirò G, Travaini L, De Cicco C, Mazzarol G, et al. Internal mammary node lymphoscintigraphy and biopsy in breast cancer. Q J Nucl Med 2002;46:138-44. Krynyckyi BR, Chun H, Kim HH, Eskandar Y, Kim CK, Machac J, et al. Factors affecting visualization rates of internal mammary sentinel nodes during lymphoscintigraphy. J Nucl Med 2003;44:1387-93. Pelosi E, Bellò M, Giors M, Ala A, Giani R, Bussone R, et al. Sentinel lymph node detection in patients with early-stage breast cancer: Comparison of periareolar and subdermal/peritumoral injection techniques. J Nucl Med 2004;45:220-5. Lin KM, Patel TH, Ray A, Ota M, Jacobs L, Kuvshinoff B, et al. Intradermal radioisotope is superior to peritumoral blue dye or radioisotope in identifying breast cancer sentinel nodes. J Am Coll Surg 2004;199:561-6. Johnson CB, Boneti C, Korourian S, Adkins L, Klimberg VS. Intraoperative injection of subareolar or dermal radioisotope results in predictable identification of sentinel lymph nodes in breast cancer. Ann Surg 2011;254:612-8. Krynyckyi BR, Miner M, Ragonese JM, Firestone M, Kim CK, Machac J, et al. Technical aspects of performing lymphoscintigraphy: Optimization of methods used to obtain images. Clin Nucl Med 2000;25:978-85. Sanli Y, Berberoglu K, Turkmen C, Ozmen V, Muslumanoglu M, Igci A, et al. The value of combined peritumoral and subdermal injection techniques for lymphoscintigraphy in detection of sentinel lymph node in breast cancer. Clin Nucl Med 2006;31:690-3. Celliers L, Mann GB. Alternative sites of injection for sentinel lymph node biopsy in breast cancer. ANZ J Surg 2003;73:600-4. Borgstein PJ, Meijer S, Pijpers R. Intradermal blue dye to identify sentinel lymph-node in breast cancer. Lancet 1997;349:1668-9. Klimberg VS, Rubio IT, Henry R, Cowan C, Colvert M, Korourian S, et al. Subareolar versus peritumoral injection for location of the sentinel lymph node. Ann Surg 1999;229:860-4. Ahmed M, Purushotham AD, Horgan K, Klaase JM, Douek M. Meta-analysis of superficial versus deep injection of radioactive tracer and blue dye for lymphatic mapping and detection of sentinel lymph nodes in breast cancer. Br J Surg 2015;102:169-81. Mariani G, Erba P, Villa G, Gipponi M, Manca G, Boni G, et al. Lymphoscintigraphic and intraoperative detection of the sentinel lymph node in breast cancer patients: The nuclear medicine perspective. J Surg Oncol 2004;85:112-22. Nieweg OE, Jansen L, Valdes Olmos RA, Rutgers EJ, Peterse JL, Hoefnagel KA, et al. Lym-phatic mapping and sentinel lymph node biopsy in breast cancer. Eur J Nuc Med 1999;26:S11-6. Pritsivelis C, Garcia Mendonça CA, Pinheiro Pessoa MC, Coelho-Oliveira A, Gutfilen B, Barbosa Da Fonseca LM, et al. Failure predictors of the sentinel lymph node in patients with breast cancer using Tc-99m sulfur colloid and periareolar injection. Q J Nucl Med Mol Imaging 2007;51:189-93. Krausz Y, Ikeda DM, Jadvar H, Langleben D, Birdwell R, Strauss HW, et al. 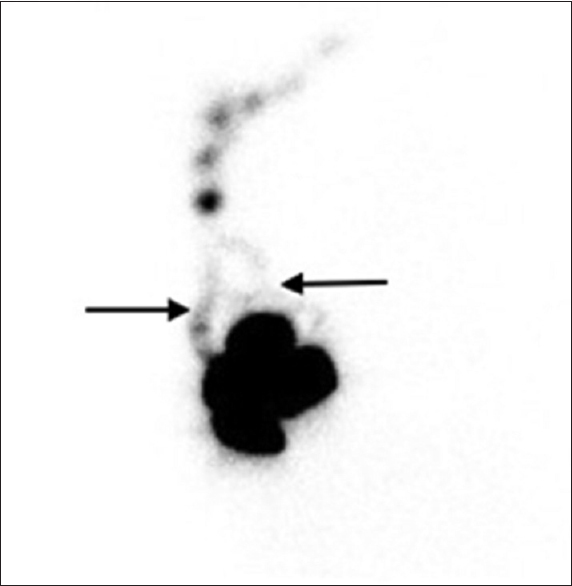 Non-visualization of sentinel lymph node in patients with breast cancer. Nucl Med Commun 2001;22:25-32. Cox CE, Dupont E, Whitehead GF, Ebert MD, Nguyen K, Peltz ES, et al. Age and body mass index may increase the chance of failure in sentinel lymph node biopsy for women with breast cancer. Breast J 2002;8:88-91. Lamonica D, Edge SB, Hurd T, Proulx G, Stomper PC. Mammographic and clinical predictors of drainage patterns in breast lymphoscintigrams obtained during sentinel node procedures. Clin Nucl Med 2003;28:558-64. Rodriguez Fernandez J, Martella S, Trifirò G, Caliskan M, Chifu C, Brenelli F, et al. Sentinel node biopsy in patients with previous breast aesthetic surgery. Ann Surg Oncol 2009;16:989-92. Shimazu K, Tamaki Y, Taguchi T, Motomura K, Inaji H, Koyama H, et al. Lymphoscintigraphic visualization of internal mammary nodes with subtumoral injection of radiocolloid in patients with breast cancer. Ann Surg 2003;237:390-8. Manca G, Volterrani D, Mazzarri S, Duce V, Svirydenka A, Giuliano A, et al. Sentinel lymph node mapping in breast cancer: A critical reappraisal of the internal mammary chain issue. Q J Nucl Med Mol Imaging 2014;58:114-26. Canavese G, Gipponi M, Catturich A, Di Somma C, Vecchio C, Rosato F, et al. Pattern of lymphatic drainage to the sentinel lymph node in breast cancer patients. J Surg Oncol 2000;74:69-74. Hindié E, Groheux D, Hennequin C, Zanotti-Fregonara P, Vercellino L, Berenger N, et al. Lymphoscintigraphy can select breast cancer patients for internal mammary chain radiotherapy. Int J Radiat Oncol Biol Phys 2012;83:1081-8. Roumen RM, Geuskens LM, Valkenburg JG. In search of the true sentinel node by different injection techniques in breast cancer patients. Eur J Surg Oncol 1999;25:347-51. Fregnani J, Macea J. Lymphatic drainage of the breast: From theory to surgical practice. Int J Morphol 2009;27:873-8. Tuttle TM, Zogakis TG, Dunst CM, Zera RT, Singletary SE. A review of technical aspects of sentinel lymph node identification for breast cancer. J Am Coll Surg 2002;195:261-8.